The self-diagnosis function is incorporated in the ecm. The function has two modes, “user mode” and “dealer mode”. The user can only be notified by the lcd (display) panel and led (fi indicator light). To check the function of the individual fi system devices, the dealer mode is provided. In this check, the special tool is necessary to read the code of the malfunction items. When one of the signals is not received by ecm, the fail-safe circuit works and injection is not stopped. In this case, “fi” and odd / trip / clock / panel light brightness / lap time counter are indicated in the lcd panel and motorcycle can run. The injection signal is stopped, when the camshaft position sensor signal, crankshaft position sensor signal, tip-over sensor signal, #1, #2, #3 and #4 ignition signals, #1, #2, #3 and #4 injector signals, fuel pump relay signal or ignition switch signal is not sent to ecm. In this case, “fi” is indicated in the lcd panel. Motorcycle does not run. the lcd panel indicates “chec” when no communication signal from the ecm is received for 5 seconds. 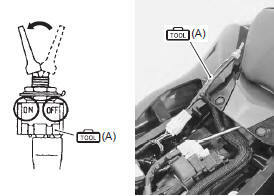 the ignition switch is turned on, and the engine stop switch is turned off. In this case, the speedometer does not receive any signal from ecm, and the panel indicates “chec”. If chec is indicated, the lcd does not indicate the trouble code. It is necessary to check the wiring harness between ecm and speedometer couplers.The possible cause of this indication is as follows: engine stop switch is in off position. Side-stand/ignition inter-lock system is not working. Ignition fuse is burnt. the lcd panel indicates “sd” when the steering damper solenoid malfunction, battery abnormal voltage and speed sensor malfunction occurred. The defective function is memorized in the computer. Use the special tool’s coupler to connect to the mode select switch. The memorized malfunction code is displayed on lcd (display) panel. Malfunction means that the ecm does not receive signal from the devices. These affected devices are indicated in the code form. before checking the malfunction code, do not disconnect the ecm coupler. If the coupler from the ecm is disconnected, the malfunction code memory is erased and the malfunction code can not be checked.